Seton Hall Law School offers an in-person or online Masters of Laws (LLM) degree in Health Law. The LLM degree provides attorneys with the opportunity to explore health law and policy or to focus more narrowly on courses designed for the lawyer planning to represent the health provider, payor, regulator, patient, and pharmaceutical companies. The LLM degree program, whether taken in-person, online or a combination of both, enhances the knowledge and skills possessed by practicing health care attorneys, as well as those seeking to expand their practice to health care clients. A candidate seeking admission to the LLM program must have a J.D. degree from a law school that is approved by the Section of Legal Education of the American Bar Association or the foreign equivalent from a school of law. As Seton Hall Law School admits highly qualified candidates, the program is very competitive. The Admissions Committee considers practice experience, graduate degrees in the health field, quality of law school academic record, demonstrated interest in health, drug or biotechnology law, and evidenced ability to excel in academic pursuits. The application process is a rolling application process and applications for admission are accepted at any time. LLM candidates must complete 24 credit hours of course work at the Law School or in eligible online courses. LLM students are expected to complete all course work within six years. The Health Law LLM candidate may pursue one of two sub-specialties: traditional health law or drug/biotechnology law. 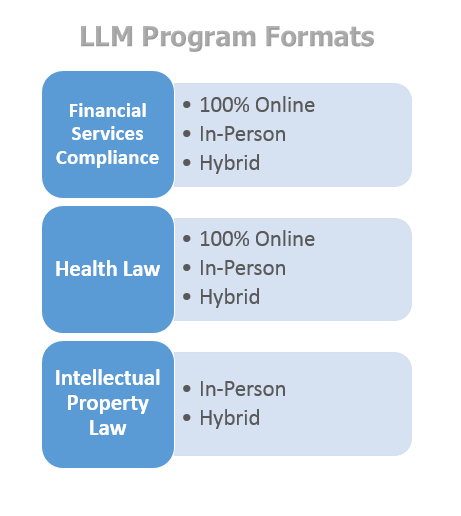 Some students also integrate intellectual property courses as part of their health law studies. The health faculty and administration work closely with each student in selecting electives appropriate to the student’s sub-specialty. The in-person LLM student shall write his or her advanced writing requirement in an 3-credit AWR seminar taught by a full-time faculty member. The full-time faculty member teaching the AWR seminar shall serve as the LLM student's supervisor. The final paper should be of Law Review publishable quality, and at least 25 pages in length. The online LLM student shall write his or her advanced writing requirement in a 2-credit graded writing mentorship, under the supervision of one or more faculty members. During the mentorship, students will conduct advanced research on one or two topics relevant to the student's degree program and produce one or two written papers of Law Review publishable quality, totaling 25 pages in length. This Legal Practice course connects the substantive health law that students are learning in their health law classes with the legal skills and problems that commonly arise in the practice of health law. The course uses a mixture of lecture, guest speakers, class discussion, group work, simulations, and writing exercises to explore substantive law and skills specific to three common health law practice settings: government (enforcement, legislative, or regulatory); in-house counsel at a non-profit hospital or health insurer; and patient representation (policy, advocacy, or direct services). For example, students may negotiate and draft agreements between providers and hospitals, conduct investigative inquiries using redacted medical records and other investigative materials in a professional licensing investigation, and research, draft, and promote model health legislation from an advocate's perspective. In-person students should indicate on their exams that they are LLM candidates. This will allow professors to exclude graduate students from the mandatory grading curve. No other reference to identity should be indicated on the exam. Every effort to maintain a student's anonymity will be made; however, anonymity may sometimes be compromised due to the small number of graduate students enrolled in a given class. For additional information, please contact Enrollment Services at [email protected] or request information online.